To he that overcometh will I give to eat of the tree of life, which is in the midst of the paradise of God. There are times when things look very dark.. when clouds of hopelessness seem to linger in a thundery sky. These are often times when one needs to wait in hope… until the longed-for deferred fulfilment of a precious promise is at last rewarded. and the fields shall yield no meat.. This is the point where hope is deferred. This is the state where hope is put through the testing mangle. This is the place where greatest patience and trusting hope must be exhibited… where Love and Faith support the weary arms of Hope.. just as Joshua and Hur held up the weary arms of Moses, until the precious desire blossoms forth as a Tree of Life.. for Hope deferred maketh the heart sick, but when the desire cometh it IS a Tree of Life.. So refuse to despair. Rejoice in the Lord, and joy in the God of your salvation. Deferred hope is not something that only you are facing today… It is Job – in his tempest. It is Abraham, on the long and dusty road to Moriah: It is Moses, in the blistering deserts of Midian; It is Elijah, beside the evaporating brook of Cherith. It is Habakkuk, trembling in his Shigionoth. It is the Son of Man, prostrate in the Garden of Gethsemane. There is no patience so hard to bear as hope that has been deferred. This is waiting for a delayed hope, which requires endurance, patience, perseverance. 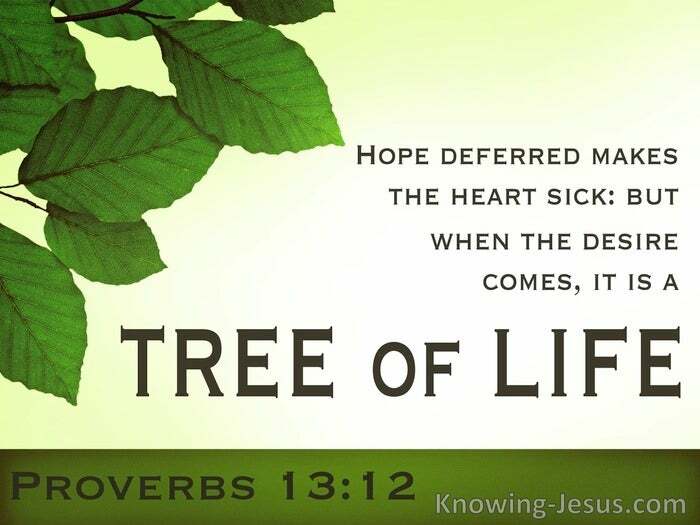 For hope deferred maketh the heart sick – but when the desire cometh, it is a tree of life. How glorious that little word BUT. But.. BUT GOD. God can cause the distressing delay to blossom into a thing of beauty. God can replace the chalice of bitter herbs with a brimming cup of blessing. God will change the long night of waiting into a morning of joy and rejoicing. Job’s eyes were opened, discovering, Thou canst do everything’. Abraham saw His Jehovah Jireh as the One Who, provides Himself a Lamb. In the cleft of the rock Moses watched, as the glory of the Lord passed by and Elijah wrapped his face in his mantle as he heard whisper the still small voice… and the Son of Man? The Son of Man Who for the joy that was before Him.. prostratedHimself in the Garden of Gethsemane.. endured the cross, despising the shame – so that we may eat of that Tree of Life: for to him that overcometh will I give to eat of the tree of life. When deferred hope makes your heart sick.. when the desired hope at long last appears remember it is a Tree of Life. Blessed are they that do His commandments, for they have the right to eat of the Tree of Life. To him that overcometh will I give to eat of the tree of life, which is in the midst of the paradise of God.